1 w/California King, 1 w/Queen, 1 w/2 Bunk Sets. Guest Linen Option. Wonderful Ocean View from the New front deck and great room. Enjoy the fresh Ocean breeze from the side deck. On our expanded back deck we have a hot tub for your enjoyment. There is a Charcoal Grill, Beach Cart and Beach Chairs for your use during your vacation. For your convenience we have an outside shower to enjoy after your trip back to the Beach. The inside of the home has updated furnishings including bedding, additional sleep sofa and chair, and laminate and tile floors. Flat screen TVs in a the bedrooms (except the kid's room), a Blu-Ray player in the living room, WiFi internet access, and a washer and dryer. After your stay in this beach cottage you will have No Regrets! We look forward to your visit. One Level: SW King Master Bedroom w/TV/DVD and Shower Bath, NW Bedroom w/2 Twins and TV/DVD, NE Queen Bedroom w/TV/DVD Player, Hall Bath, Fireplace in Living Room, TV’s and DVD’s in all Bedrooms and Living Room, Beach Chairs, Cart, Umbrella, BBQ Grill, Hot Tub on back Deck of House North Side, w/Ocean Views. Great location, great little house, but could use some TLC. We love Kitty Hawk. We loved the location. Girls beach week! The house was accommodating, but could use a lot of deep cleaning and updating. The bathrooms in particular need a deep cleaning. The outside furniture in the back was unusable. The hot tub was good, but had broken parts. The bedspreads and mattress covers were gross. Again, it could be a nice place if it was deep cleaned and had the broken and old items replaced. The outside shower was good. The beach chairs and umbrella need replaced, bring your own. The kitchen cabinets had everything you needed, but could be cleaned out of extra stuff. We enjoyed the front porch, but again if it were updated with a table and umbrella it could be much better. All in all we liked the house, just wished it was cleaner and had furnishings that were not broken. Would I stay again? Yes, but would have to bring my own beach supplies and spend the first day washing and cleaning everything. The location is the beast thing about this house. Thank you for your review. We apologize about the cleaning issues. While houses often do show some wear at the end of the season, you expect NOTHING less than a clean home. Next time, please make us aware and will immediately get someone out there to take care of all of your cleaning issues. We hope to see you next year. "No Regerts" . . . sorry, we were having a good time! One word: wonderful. If you appreciate world-class customer service, Beach Realty is the rental company for you. The friendly, knowledgeable, helpful staff is the best in the business. Our housekeeping and maintenance requests were taken care of posthaste. The cottage: convenient location, comfortable furnishings, nice layout. The front porch overlooking the ocean cannot be beat (would be nice to have more high chairs!). While the kitchen is nicely equipped, the pots and pans are really showing their age. Love the hot tube. Lounge cvhairs on rear deck need attention, though. Our nitpicks would be just that and not worth mentioning here. Our only regret: we stayed for two weeks, not three! We love having you as our guest! Thank you for taking the time to share your experience with us! Our priority at Kitty Hawk Rentals is to provide top-level customer service, and we strive to ensure a positive guest experience. Rental was in a great location! Nice home, but needs a few upgrades. Bathrooms could of been cleaner. All in all, we had a great time making memories! GREAT LOCATION & WEATHER. COMFORTABLE HOME, THOUROUGHLY ENJOYED THE HOT TUB. INTERNET (CABLE COMPANY ROUTER) DID NOT FUNCTION MOST OF THE WEEK & DISHWASHER LEAKED. THIS WAS OUR 3RD TIME AT NO REGRETS AND WILL DEFINITELY STAY AGAIN. No Regrets about the wonderful memories we made in Kitty Hawk! 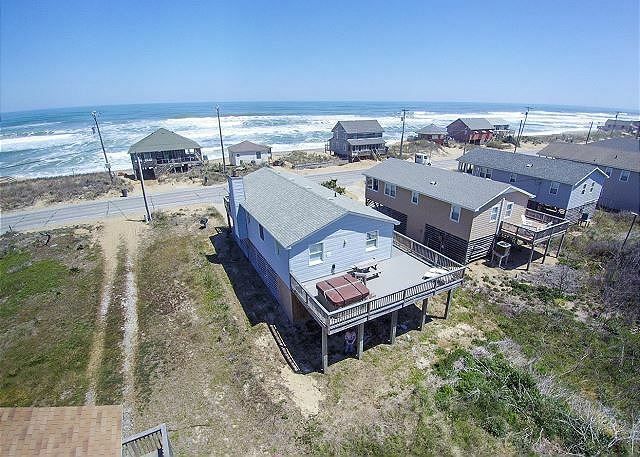 Our family, 2 adults and 4 kids (17 - 23) has “No Regrets” about our recent stay in Kitty Hawk at this property. Everything was as listed on the website. The check-in with Beach Realty was simple. The location & view were ideal. Easy walk to the beach, made even easier with the beach cart provided. The view was inspiring and the deck a wonderful place to relax in the late afternoon and evening (the sun was too intense for use in the early part of the day.) The kitchen had everything we needed. The bedrooms were comfortable. The bathrooms were small, but functional. The outdoor shower was convenient. We took advantage of a discount and reserved 4 bikes from Ocean Atlantic Rentals with delivery and pick up. Couldn’t have been any easier! Loved biking in the morning to Duck Donuts and several other eateries. And speaking of restaurants, visit the Rundown Café and Art’s Place! We also did a 6pm Jeep tour with Corolla Outback and saw the wild horses. What an experience for our family to share. We know we’ll be back to the OBX area again! Thank you for taking the time to give us feedback! We are thrilled you enjoyed your vacation with us! Great time at the beach. The house had everything we needed and was in a great location. Beach chairs were provided so that was one less thing to bring. My only gripe would be that the bathroom floors weren't quite clean enough. Two couples from Barnegat, NJ have been at many different homes from Avon to Kitty Hawk. This was the first time in Kitty Hawk NC for us. This vacation retreat was wonderful for us. The house was a perfect size and amenities. The exterior of the home is impeccable and when we opened the front door, we were pleasantly surprised on the beach décor and the overall condition. 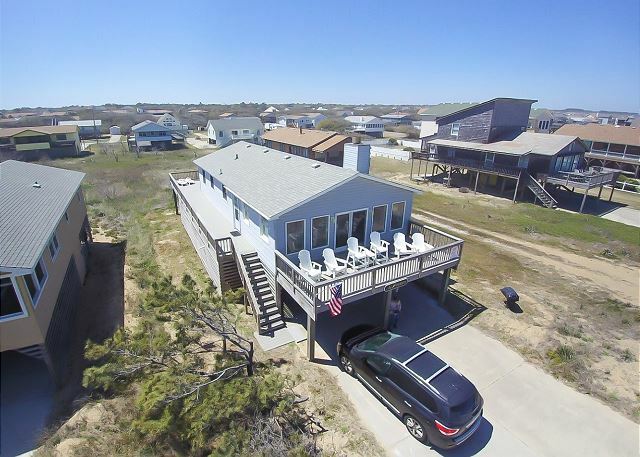 Spending days on the beaches across the street, evenings in the large hot tub and into the late night on the ample front deck. No we have no REGRETS stayin here. Had a great week and the overall of the house was good. I was a little disappointed with the basic cable. My kids ( elementary/middle) like to watch tv after a day at the beach and there were no cartoon or many family channels. I had to run out to get basic supplies like coffee filters, grill spatula. The bathrooms were a little out dated which made them look dirty. Great view made it all worth it. It was our luck to find such a gem in KH. The views and open floor plan enhanced our vacation. The ease of the ocean and convenience of location will keep us coming back. We enjoyed some great restaurants like Owens, Rundown and JK Seafood and Steaks to name of few. We hope to return to enjoy the fresh seafood and splendid menus. The property owner accommodated our early cable issues while customer service was the professional liaison you would expect. We were most grateful. No Regrets for great vacation! My wife and I enjoyed our first beach vacation in over 30 years without kids! The house is as described and clean. Probably a bit better than I expected going in. Great views of the ocean from the deck and living area. We made good use of the hot tub. Virginia Dare rd is a bit noisy at times, but the proximity is great with easy access to beach. Great house and great weather = great time. Andy, we are glad you had a great time! We hope to see you next year! The location, the amount of space was great. Loved the hot tub, a great way to end the day. The beach was close the sound of the waves very relaxing. This home is close to all the attractions you could ever want. The agent Faith wa very attentive to all my question, thanks for a super vacation. Diane, thank you very much for taking the time to share your experience with us! We are so glad that you enjoyed yourself. Faith is one of the most knowledgeable agents on this beach! We hope to see you again soon! I couldn't have asked for better accommodations. It was clean, they had beach toys and chairs etc. only thing negative I can say is with all the cabinets in the kitchen, there so full you don't really have space to put anything but a frw grocery's. 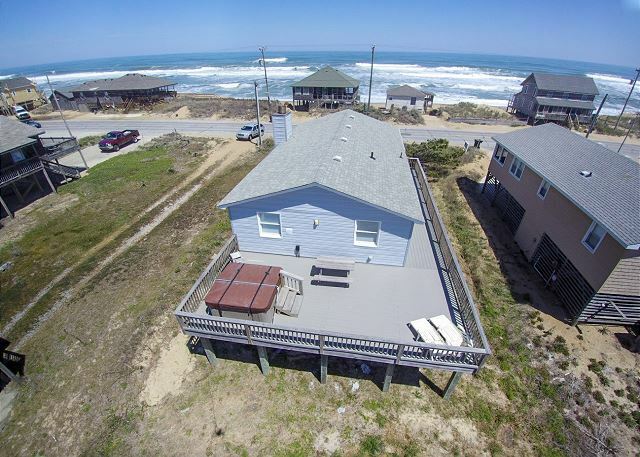 We have been going to the OuterBanks for the last 23 years, I would say this was the best house we have rented. A lot of updates, clean, well stocked and very close to the beach (especially because the house across the street is vacant at the moment) but the public crosswalk is very close anyway. The master bath looks newer than the other one but that one isn't bad. Nice having sheets and towels supplied included, also a nice hot tub. Philip, we are thrilled to hear you had a great stay. Thank you for taking the time to leave us a review. We hope to see you next year. Very nice and clean rental property.